"I really used the mirror as a device for an interior on a small scale," he explained. "Always the same mirror, which I like and know." For Lucian Freud the knowing and liking were mutually vital and this five-foot Georgian overmantel mirror stayed with him. It had come down in the world by the time he first set eyes on it in 1943 in the hallway at 20 Delamere Terrace, in what was then slum Paddington. It became one of his few possessions in the upstairs flat there overlooking the canal, along with a stuffed zebra head. Though not in fact always the one Freud used, it was until the mid-70s his main mirror for giving him odd angles, distancing and that slight sense of behind-the-glass isolation. For as their titles often indicate – Reflection (self-portrait), Painter working, reflection, his self-portraits were, of course, mirror images of a face that to him needed no introduction, the face that frowned commandingly or squinted with the effort of examining itself in profile. As he said: "Painting myself is more difficult than painting people, I've found. The psychological element is more difficult. Increasingly so." The poet Nanos Valaoritis, who first encountered an intense young Freud in Greece in 1947, went further, describing him as a combined dramaturge and reflector. "He is a sort of mirror. L invents a personality for people, which he imposes upon them by the force of conviction and concentration." That's putting it a bit strong; though, true enough, the paintings from the late 40s of Kitty Epstein, Freud's huge-eyed first wife, show her sitting to order, as it were, first bedazzled then shrinking. The self-portraitist's mirror remained to hand. He took it from painting place to painting place, from Paddington to Maida Vale. It ended up in the kitchen of the top-floor flat in Holland Park that served as his studio until the final years. The one painting in which it actually features, frame and all, is Small interior (self portrait), begun in 1968 and completed three or four years later, in which it looks as though he's dancing attendance on it: his old friend the mirror. Diminutive in the reflection, contemplating his next brush move, the painter seems torn between doing this little picture or getting on with what was to become Large interior, Paddington 1968-9 (shown, barely begun, on an easel beside him) or, possibly, perfecting the glossiness of the leaves in the magnificent Interior with plant, reflection listening (self-portrait), 1967-8. Whatever. This is Freud giving himself pause. Just think: here's a representation of a reflection involving the representation of a reflection of his largest painting for years in which a resentful child, his daughter Ib, lies planted under a spreading zimmerlinde on a paint-smudged floor. Ostensibly a straightforward studio scene, Small interior compresses possibilities. The complications in a Freud involve rather more than mirror-play. They aren't to do with symbolism (which he loathed as a metier) or surreality (why be clever-clever? ); for him a fascination with appearances was motivation enough. He saw himself in a hand mirror wedged into the frames of a sash window. He peered at a morning-after acquisition: a ripe black eye. Love came into it: the intentness of love and the abeyance of love. Hotel Bedroom, 1954, shows him holed up with Caroline Blackwood, the newly-weds not enjoying their poky, shared accommodation in the Hotel La Louisiane, rue de Seine, she shivering in bed, he standing over her, his darkening presence transposed from the image he studied in the bevelled mirror on an unseen wardrobe door. Caroline complained about being made to look older than she was, but the bitten nails and the little finger lodged on her lower lip are telling. The marriage was soon over. "Making a picture," Matisse said, "would seem as logical as building a house, if one worked on sound principles. One should not bother about the human side. Either one has it or one hasn't. If one has it, it colours the work in spite of everything." For Freud there was no question but that making paintings came first. Yet, as one who lived by urges, attractions were there to be sprung. Instinct was foremost at all times. "The eyes give the messages to the brain," he once said to me, "and not all of these, by any means, come out in the form of speech. (I mean the information gathered, and the subsequent ideas.) The painter looking at a person thinks things that the other person jolly well doesn't want thought about them, and makes guesses which are really impertinent. It's to do with the inherent life in people." The human side and, wider, the animal side, was for him the main event. Painting one-to-one he had the advantage of being the initiator with work to do, thus wholly in charge. With two people or more he faced complication, distraction possibly, and never more so than in the early 80s, when he had the idea of restaging a Watteau. He knew the original painting – Pierrot Content, featuring the commedia character seated in a glade with frivolous companions – only in reproduction. His version, enormous in comparison, is a sky-lit tableau set in what was, at that time, his quite recently converted Holland Park studio. "I wanted the setting to be a slightly deliberate setting," he said. "It's the nearest thing I have ever come to casting people rather than painting them, but they're still portraits, really. They are also characters. A slight bit of role-playing they are doing, but I didn't try and forget who they were. In the end they are just there." He showed them his photograph of the Watteau and told them that he wanted something similar. A situation is presented. "Like the artless shots in Bunuel which are necessary to set up the rest," he suggested. There his characters sit, "slightly costumey", four on a bed, the light falling evenly on them, the scent of the verbena mingling, we may deduce, with the whiff of paint. They include a daughter and two girlfriends from different times. "I didn't want to make too much about the unity, the fact that people are sitting next to each other, know each other very well, not at all, or slightly. I'm interested in all that aspect of things: the people and to what degree they are affected by being near each other (that's one reason I like Franz Hals so much); not cold-shouldered but each wrapped up in themselves." When Large Interior W11 (after Watteau) went on show at Agnew's in 1983 more than one reviewer took it to be a study of bohemian folk living in squalor. "A sordid room … peeling walls, a nasty sink and the sort of all-too visible plumbing the English are prone to accept," Terence Mullaly wrote in the Telegraph, adding: "Lucian Freud has always seemed to me grossly overrated and this picture confirms my opinion." He wasn't alone in this; disapproval revolved around the raw plaster and fittings and zoomed in on the awkwardness of the posed figures, so obviously unused to sitting together. Freud proceeded by dint of ruthlessness, pressing on where others settled. Failures were ripped. "Sometimes things that go wrong with me are through concentration (like when you forget to put your trousers on)." Successes were downright. "Nothing tentative." Working his way across Leigh Bowery's bare back, he approached those wide areas of pallid skin like Alps as yet unsurmounted. "Though I hope to strain the onlooker's sensibilities what I'm really interested in is outraging my own." Confrontational in his realism he treated everything, buttercups, babies, a monarch even or a dozing whippet, floorboards and all, as the stimuli whereby observation catches hold. Such realism is the tap root of art, perpetually modern. In that he insisted that everything he drew or painted was a portrait, Freud recognised no distinction between genres. The National Portrait Gallery's decision to restrict its otherwise splendid great exhibition to human portraits only is unimaginative though not unreasonable. Freud relished the prospect of having retrospectives, but in the event found them disconcerting. When he went one Sunday morning 10 years ago to check out the hang of his Tate retrospective, he pronounced himself pleased, but then took me to one side. There was just one thing, he felt. "William, would you mind if we put my hand mirror self-portrait next to that small one of my mother?" Easily done and, sure enough, they went well together. "Oh, thanks awfully," he said. He didn't return to look through his assembled work more than a few times. It really depressed him, he explained, to see so many portraits of people he'd known and liked and who were now dead. 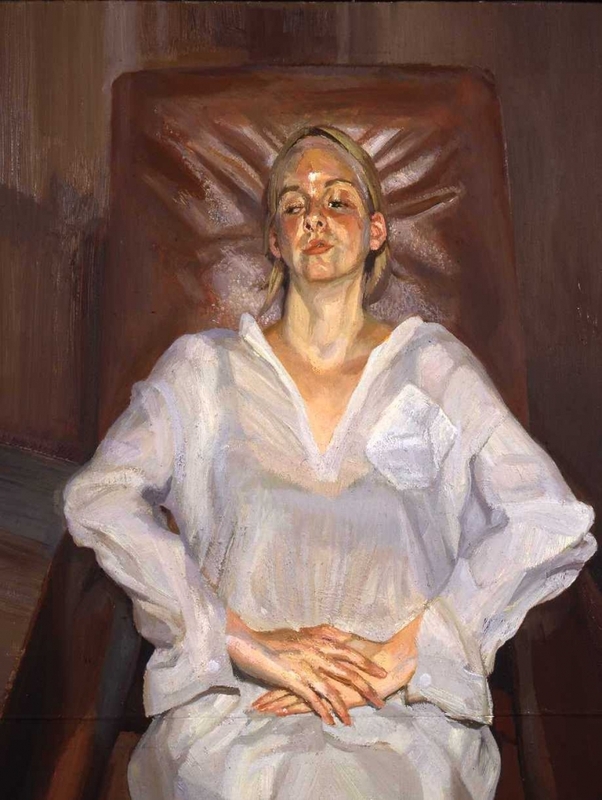 • William Feaver, currently engaged on a biography of Lucian Freud, has curated Lucian Freud Drawings at Blain/Southern, London, 17 February to 5 April and Acquavella, New York, 1 May to 9 June. © 2012 Guardian News and Media Limited or its affiliated companies. All rights reserved.